4AZV-W system, Outer Passage region. On the 30th of March at 19:49 EVE Standard Time, a battle unfolded in the system over a couple of SOLAR FLEET [SOLAR] Rorqual industrial capital ships. The battle began after a roaming gang belonging to Project.Mayhem. [16-13] charted a wormhole route to the region. The gang then commenced its roam through the region, sending scouts and interdictors to forage ahead and find targets. 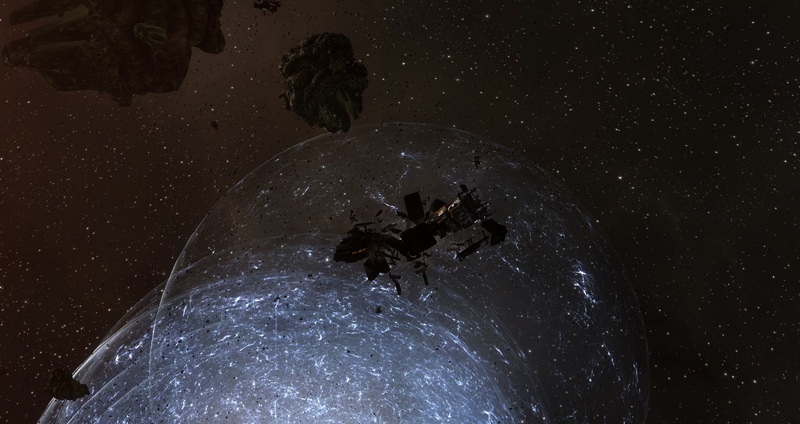 The scouts managed to found and subsequently tackle two Rorquals in a mining anomaly, prompting the fleet to burn to the system and aid in pinning down the ships. With the Rorquals held down by the interdictors, Project.Mayhem. quickly called for allies and its own pilots to form a reinforcement fleet of Tengu strategic cruisers. Another roaming gang in the region belonging to SE7EN-SINS [SIN7] was contacted and agreed to aid Project.Mayhem., arriving in the system shortly and joining the combatants. The Rorquals themselves proved to be quite tough to crack, and any attempt by the hostiles to bring them down met in failure. As the reinforcement fleet made its way to the system, one of the Rorquals lit a cynosural beacon to allow a SOLAR FLEET Machariel battleship fleet to bridge into the system. The estimated 50 pilot Machariel fleet backed by four force auxiliaries materialized on the grid just as the Project.Mayhem. reinforcements entered the system. This led to the ragtag fleet bolstered by the strategic cruisers to clash with the battleships, starting a battle over the tackled capitals. The two sides fought in a furious close range exchange, the battleships easily volleying the non doctrine ships like Cynabal and Orthrus cruisers. However the strategic cruisers proved a much harder to destroy thanks to their robust shields. At the same time, the assembled attackers had a hard time breaking through the massive armor of the Machariels, especially due to the number of force auxiliaries on the field. Constant rapid target switches were necessitated to throw off the force auxiliaries. More and more hostiles arrived in the system to aid Project.Mayhem., including a small Out of Sight. [OOS] Sleipnir command ship gang. This brought the number of attackers to nearly 150 pilots versus the paltry 50 SOLAR FLEET was able to field. Whats more, the hostile forces kept close to the battleships who were equipped with artillery cannons. This meant the Machariels had trouble tracking the smaller ships who used it to their advantage. This slowed down the rate of casualties for the aggressors, who in turn stepped up their attacks and started thinning the ranks of the SOLAR FLEET’s force. More and more Machariels were brought down as the battle raged on, the assembled firepower on the field great enough to power through the force auxiliaries remote repair cycles. What started as a back and forth struggle was slowly turning into a one sided slaughter as the Project.Mayhem. led coalition demolished the Machariel fleet. The destruction of the Machariels’ gathered pace, from a trickle to a flood as Machariels exploded left and right on the field, overrun by the strategic cruisers. Within minutes, the entire fleet had been destroyed, only a few survivors managing to flee the massacre. With the battleships dealt with, the attackers turned their attention on the force auxiliaries. Yet before they could fire a shot, the three Ninazu force auxiliaries on the field initiated self destruct sequences, resigned to their fate. The force auxiliaries exploded one after the other with the hostiles not needing to waste a shot. Next on the list was the lone Apostle force auxiliary. The hostiles let it keep cycling its triage module until it ran out of fuel, shooting instead at the Rorquals. Finally it ran out of Strontium Clathrates, at which point the Tengu fleet switched fire back to it and easily dispatched it. [ 2017.03.30 20:35:10 ] (notify) Ninazu belonging to Queen Victoria 13th self-destructs. [ 2017.03.30 20:35:18 ] (notify) Ninazu belonging to Pagrandis Estemaire self-destructs. [ 2017.03.30 20:37:43 ] (notify) Ninazu belonging to Xakim Sgt self-destructs. Then came the tricky part. The Rorquals were still formidable ships capable of soaking a lot of damage. Instead of breaking their head and firing their guns at the capital ships’ shields until they ran dry, Project.Mayhem. fleet commanders decided to bring in a dreadnought. Utilizing their knowledge of wormhole space, the alliance managed to squeeze through a Revelation dreadnought and bring it to the field. With the addition of Curse force recon cruisers who specialize in capacitor warfare, the two aided in the swift demise of the ships. With the Rorquals destroyed, the different fleets looted the wrecks, some needing the salvaged modules to pay for losses incurred in the fight. With the scavenging done, the different groups extracted back to their respective staging systems bringing an end to hostilities. Battle report for the 4AZV-W system can be found here. All told the battle lasted 55 minutes with Time Dilation not reported and the system hosting an estimated 240 pilots at the peak of the fighting. SOLAR FLEET lost 71 ships in the fight including 4 force auxiliaries, 2 capital industrial ships and 33 battleships for a total of 56.07 billion ISK damage. Project.Mayhem. and its myriad of allies lost a combined 35 ships, including 5 strategic cruisers and 17 cruisers for a total of 9.66 billion ISK damage. Somebody essentially help to make severely articles I’d state. This is the very first time I frequented your web page and up to now? I surprised with the research you made to create this actual post extraordinary. Wonderful task! What is the most effective means to look for blogs you want? Hi there, I discovered your web site by the use of Google even as searching for a similar matter, your website got here up, it seems to be great. I’ve bookmarked it in my google bookmarks. I such as Facebook, but I hate that their notes area isn’t as enticing as MySpace’s blog sites. I’ve recently transferred a blog site from MySpace to Facebook using the “share” icon situated underneath each blog site … Nonetheless, I do not like the way it shows up on my Facebook web page. Are there any far better methods to import my blogs?. I have been a yahoo individuals for some years now. I am just starting to make use of the tools which they supply, among which being blog posts. I have actually composed a blog and also wishes to know if my blog posts are being seen by others. Otherwise then does any person recognize how I get my blogs posts read. I¡¦ve learn a few excellent stuff here. Definitely worth bookmarking for revisiting. I wonder how a lot effort you place to make any such wonderful informative site. zgj5Za Very nice blog post. I absolutely love this site. Thanks! of course like your website but you have to test the spelling on quite a few of your posts. A number of them are rife with spelling problems and I find it very bothersome to inform the truth then again I¡¦ll surely come again again. PuaWM6 make men and women think. Also, thank you for permitting me to comment!